Vincent Miles (Greene) is a former Green Beret who is an excellent soldier, but has suffered some form of amnesia. Sections of his memory are lost, but occasionally tiny portions flash back into his mind. He doesn’t want to give up his military skills, so he answers an ad in, you guessed it, Soldier of Fortune magazine. He travels to the border of Afghanistan, and this chance occurrence reunites him with his former Commanding Officer, Col. Preston (Svenson). The eyepatchioed Preston teams him up with a nerdy guy named Rossi, who naturally is acting as the brains of the mission, as well as a British guy and the token chick (played by Italo Disco singer Danuta). Their mission is to recover a Soviet plane, an ultra-modern MiG, before it falls into the hands of the enemy. With Miles’ memories of a mysterious dancer (Gersak), and his having to do all the heavy lifting when it comes to this dangerous assignment, will the team make it out alive? It’s nice to see fan favorite Daniel Greene in the lead role, normally he’s relegated to smaller parts. And he does have the classic late 80’s/early 90’s cool hair if all else fails. 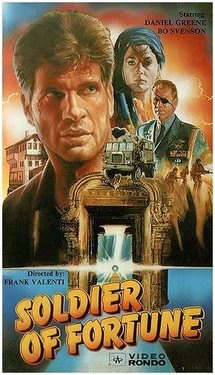 Soldier Of Fortune is a bit more competent than you might think - yes, it is your standard machine gun-shooting/blow-ups galore/guy-diving-out-of-a-guard-tower movie, but the desolate location shooting and the presences of Greene, Danuta, Gersak (however limited that may be) and of course Bo Svenson raise the level a bit. Svenson is always nice to see, and his eyepatch looks more like a discarded watchband. So, there’s that. Miles’ sidekick in the movie, Rossi, provides some comic relief as he traipses around the battle zone with cargo shorts and socks pulled up to his knees. Another facet of his character is that he “likes music” and always has a Walkman. This as they’re fighting the Spetznaz and various evil Russkies. Not to mention plenty of mustachioed locals. This movie was directed by Pierluigi Ciriaci, the man responsible for Delta Force Commando (1988) and Delta Force Commando II: Priority Red One (1990) - so there’s going to be some wackiness, inadvertent or otherwise. For example, the base of the heroes uses Disney code names. So we get dialogue, with the most unsmiling seriousness imaginable, such as: “Goofy 6 has been compromised”, “Disneyland’s in trouble” and personal favorite: “Donald Duck’s been replaced”. But just when you think things are slowing down towards the end of the movie, there’s a nice little surprise which raises things up. We won’t give any spoilers, but let’s just say that if you have enjoyed movies such as White Fire (1984) or In Gold We Trust (1991), you’ll appreciate the development. It’s just too bad this idea wasn’t utilized earlier on in the movie. Great things could have happened. We’re grateful that it did happen, but in the end, Soldier Of Fortune really isn’t super-awesome, nor is it bad. It’s kind of run-of-the-mill. Unfortunately, the only way to see this movie is the poor-quality DVD, unless you can miraculously find the Japanese VHS. Let’s hope a better edition makes it to DVD soon, the one currently available is a barely-watchable disgrace. My VHS is called "Running hero". One of my favorite Daniel Greene movies. In these decades there were a lot of great Italian B-Actionmovies. Daniel Greene is very underrated. He was awesome in Hands Of Steel. Daniel Greene is the man! Hands of Steel is one of my favorite films ever! And I just saw him in Elvira: Mistress of the Dark again recently too. lol. He was great in that as the straight-edged dorky, yet crazy buff guy. This movie is available on widescreen DVD with English dub from Germany. Nice! Would love to see a Widescreen version.